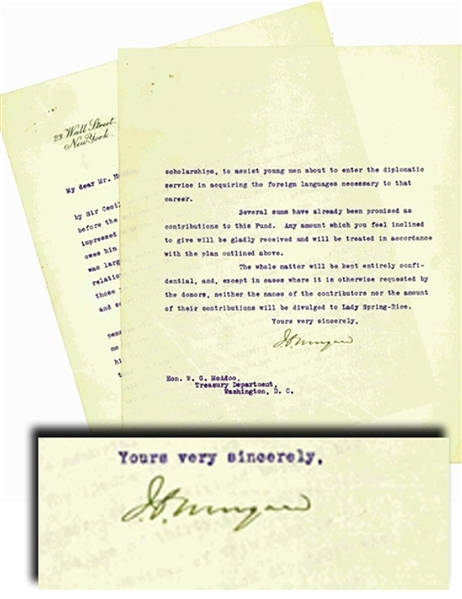 Typed letter signed "J.P. Morgan", two separate pages, 4to, June 19, 1918, 23 Wall Street, New York, addressed to Secretary of the Treasury William McAdoo, seeking funds for a memorial to Sir Cecil Spring-Rice, British Ambassador to the United States. Morgan writes: "Those of us who have followed the work done by Sir Cecil Spring-Rice during the time of his Ambassadorship…have been impressed with the debt which this country, as well as his own, owes him for his wise, sane, and tactful conduct of affairs…Sir Cecil's death deprives his family of that pension which he expected to receive. It has been suggested to me by several of his friends that a fund should be raised …for a memorial to him, which should take the form of a trust fund, the income from which should be paid to Lady Spring-Rice during her life, or divided between his two children…the whole matter will be kept entirely confidential…" The pages held together by a pin; "Spring-Rice" written in colored pencil in the right margin of page one. Fine condition. Sir Cecil Arthur Spring-Rice, (February 27, 1859 - February 14, 1918), was a British diplomat who served as Ambassador to the United States from 1912 to 1918. Spring-Rice was the son of Hon. Thomas William Spring Rice, second son of the prominent Whig politician and former Chancellor of the Exchequer Thomas Spring Rice, 1st Baron Monteagle of Brandon.